Holding to their motto of “independent narratives, journalism and action”, a group of young journalists called Mídia Ninja (Ninja Media) used the recent demonstrations in Brazil’s major cities as a stage for their guerilla approach to journalism, using smartphones and social media platforms to reach their audience. Mídia Ninja was formed two years ago as a hub for independent journalists in Brazil to tell stories with a social twist that traditional media was not covering. Until June this year, the group had 20 people working full time in six of Brazil’s major cities – São Paulo, Rio de Janeiro, Salvador, Belo Horizonte, Porto Alegre and Fortaleza. “We’re interested in showing the ‘B-side’ of things, exploring different narratives”, says Rafael Vilela, a Mídia Ninja member from São Paulo. The group came to prominence in June, when they did onsite reporting and live streaming of the mass demonstrations in São Paulo and Rio against rising transport fares that evolved into a movement against the status quo. Being at the core of the action, they were able to shoot and broadcast on their Facebook page some of the most graphic videos of the clashes between protesters and the police. Using smartphones and cameras, Mídia Ninja’s members mixed with the protesters, and ended up being targeted by the police as well. Three of them were arrested in Rio in July 22nd, during a demonstration against Governor Sergio Cabral. This demonstration was the point where Mídia Ninja’s work drew the attention of mass audiences. Rede Globo, Brazil’s biggest TV network, showed the group’s interview with protester Bruno Ferreira Telles, who was arrested on the 22 July protest for allegedly throwing incendiary bombs against the police, and was charged with attempted murder. In his interview, Bruno claimed he was innocent and urged Mídia Ninja to retrieve a video documenting he ran from the police with nothing in his hands – until then, police claimed he carried incendiary bombs when arrested. The video of barehanded Bruno being chased and detained was shown by Globo, and it helped his case. All charges against Bruno have been dropped. 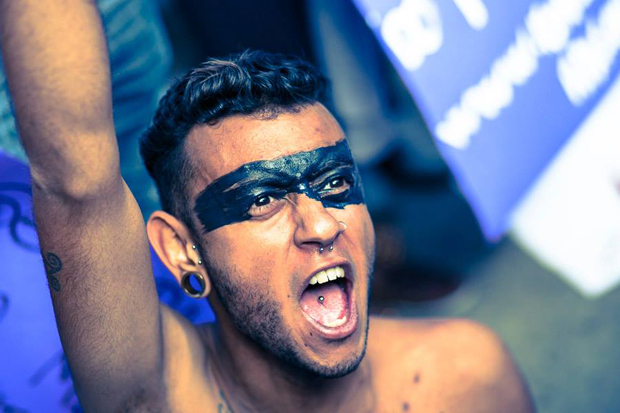 Their work during the demonstrations raised Mídia Ninja’s profile in Brazil, especially through social media. The group’s Facebook page, which now is their main platform, grew from a little over 2,000 fans before June to more than 160,000, and their network of collaborators grew to more than 2,000 people. “We’re still figuring out how to organize our collaborators work, because it’s so many people”, says Vilela. The central core of Mídia Ninja is a group of one hundred people gathered in Brazil’s main urban areas. They have no salary: most of their expenses ares paid by Fora do Eixo (Out of the Axis), a network of cultural producers that began by financing independent music festivals in Brazil’s smaller urban areas, and ended up organizing bigger events related to film, music, visual arts and street art. Most of Mídia Ninja’s members come out of journalism workshops created by Fora do Eixo, and some of them live at São Paulo’s Casa Fora do Eixo, a house where the network’s members can live and work as a community, sharing expenses. After the street demonstrations became less massive, Mídia Ninja moved forward to cover other social issues like indigenous peoples’ rights. Their goal is to broaden their work. “Since June we’ve been very focused on the demonstrations, but that’s not the only thing we want to do. There are many things to be written about – in culture, in sports, in daily life”, says Vilela. Now Mídia Ninja’s main goal is to launch crowdfunding campaigns to support their activities – like launching a website, which is on the way. Mídia Ninja is not free of criticism. One of their soft spots is precisely their closeness to Fora do Eixo. Many artists accuse Fora do Eixo and its coordinator Pablo Capilé of profiting at their expense, and also of exploiting young activists to work for the network for free. Some media specialists even dispute if the work Mídia Ninja does should be seen as journalism, because of the way they become participants of the events they were supposed to report. Digital Journalism professor Marcelo Träsel from PUCRS University in Porto Alegre, for example, says there seems to be a “promiscuous relation” between Mídia Ninja’s journalists and their objects. In the other hand, Träsel concedes that, for not playing the “impartiality card” that became common among big media, Mídia Ninja should be regarded differently than most outlets. “It’s unfair to judge (Mídia Ninja’s) practices using the ethical code that operates in more traditional newsrooms. The question here is to know to which extent Mídia Ninja’s audience is conscious of the difference between their model and the one from big media, and to recognize the filters this audience uses when they get information from one and from the other”. Rafael Spuldar is a freelance writer based in Brazil. Your link to São Paulo’s, Casa Fora do Eixo, is broken though! Thanks for the catch. Think it’s sorted now. The accusations against Pablo Capilé arisen after he showed up in the public TV channel to to expose their work and ideas, causing jalousy and fear within the traditional media. Since the accusations, none of the 2000 integrants of Fora do Eixo left the group or confirmed those accusations which have never been proved by it’s authors.